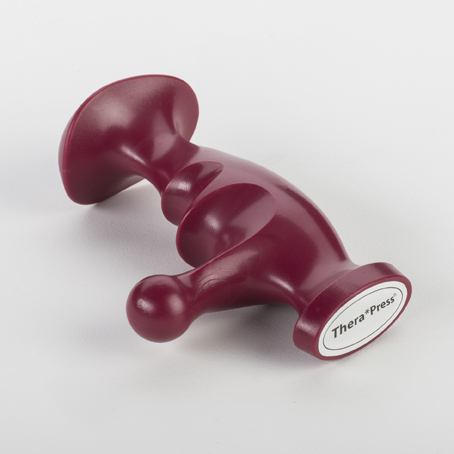 The TheraPress® 2 Trigger Point Massage Tool is an ergonomically designed, deep muscle massage tool that helps prevent wear and tear on your body. The ergonomic grip allows for correct alignment of your wrists during use. The TheraPress® 2 replaces your thump so you can apply trigger point and acupressure techniques effortlessly, while saving your hands, thumbs, and fingers. The trigger point end of the tool is shorter than the original therapress®. This is excellent for therapists with smaller hands, working on smaller muslce groups and as a companion to the Original Therapress® The Therapress®2 has multiple working surfaces which can be used for different techniques. The heal of the TheraPress® can be used to apply kneading techniques. The TheraPress® is packaged in a beautiful box and includes a colored instructional manual and makes an ideal gift.